I agree, I really doubt that Ida is still a TS, she better find that pocket of better UL environment real soon or she will drown in the shear. recent partial ASCAT suggests that the winds could be lower. forecast and the intensity consensus model. cyclone to move toward the north and then to the north-northwest. Ida's cloud pattern has not changed significantly during the day. the previous one, and is very close to multi-model consensus. models now show a much weaker system. ASCAT shows Ida still TS intensity. showed maximum winds of 30-35 kt. The storm continues to experience moderate-to-strong westerly shear. advantage of the more favorable shear conditions for a few days. intensity forecast is reduced at that time. model consensus due to continuity concerns. I suppose we can't completely put Bermuda in the clear yet from Ida, but I think the chance of this getting close is very low at this point. Its best chance by far is to be a pure fish IMO. Any other opinions on this? LarryWx wrote: I suppose we can't completely put Bermuda in the clear yet from Ida, but I think the chance of this getting close is very low at this point. Its best chance by far is to be a pure fish IMO. Any other opinions on this? The GFS a few days ago had this almost making it to New England, supposing it doesn't dissipate there may be a 50/50 chance of Bermuda getting something. It'll certainly be interesting to track in the coming week despite being weak, if it holds together. cluster of deep convection due to 25 kt of west-northwesterly shear. overall is very close to the Florida State Superensemble. trends, but it is otherwise very similar before those times. increase of the winds after that time. trough as indicated by the GFS. 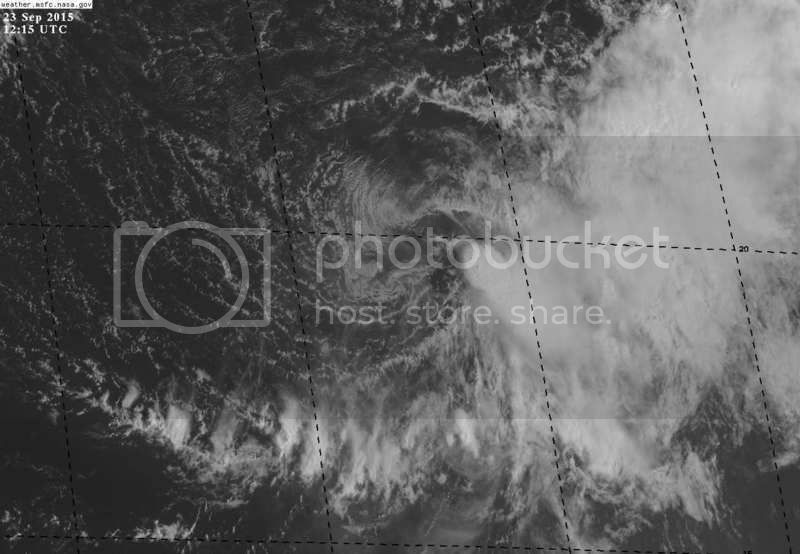 maintains Ida as a depression through the forecast period. There are no 35kt winds on that graphic. The blue winds are all 25 or 30 kts. Finally, the NHC has conceded that Ida will not regain TS strength. Odds are they'll declare it a remnant low tomorrow and stop advisories. At the start of advisories the NHC said that shear will decrease within a day, then changed it to a few days but now they say it will remain unfavorable. Shows how hard it is to forecast shear. Right now it looks like the shear is on the decrease, can Ida take advantage? likely to be much left of Ida to take advantage of the conditions. heavily on the weaker solutions of the HWRF, GFS and ECMWF models. day 5, and the official forecast follows that trend. weaker cyclone, and the official NHC prediction follows suit. with a slight increase in forward speed is forecast tonight. expected to become a remnant low over the weekend. Do I need to remind everyone how much the Euro busted with Ida? Even to some degree the GFS but not as bad as the Euro that for days it was showing Ida to become a Major Hurricane. As if the model would forget that there's a strong El Niño in its long range forecast. Ida is on her last legs. Shear is blowing away the last leftover convection to the east. Bones should be making an appearance soon. in about 24 hours or sooner. speed is conservatively set to 30 kt. guidance except for the GFS. around a strengthening mid-level ridge over the central Atlantic.